This reference architecture shows how to implement a hub-spoke topology in Azure. 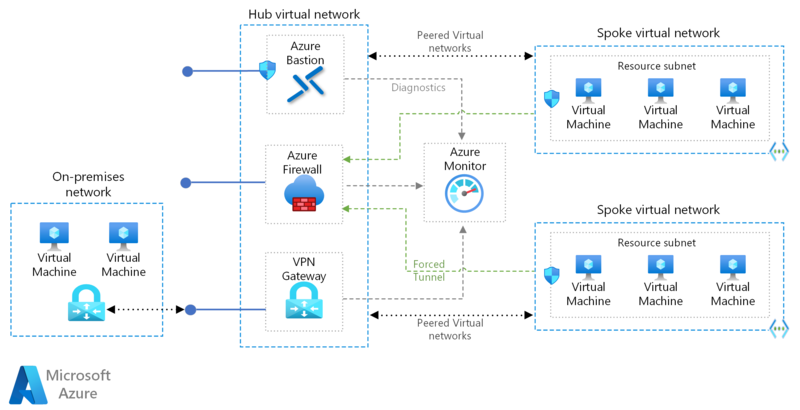 The hub is a virtual network (VNet) in Azure that acts as a central point of connectivity to your on-premises network. The spokes are VNets that peer with the hub, and can be used to isolate workloads. Traffic flows between the on-premises datacenter and the hub through an ExpressRoute or VPN gateway connection. Deploy this solution. VNet peering. Two VNets can be connected using a peering connection. Peering connections are non-transitive, low latency connections between VNets. Once peered, the VNets exchange traffic by using the Azure backbone, without the need for a router. In a hub-spoke network topology, you use VNet peering to connect the hub to each spoke. You can peer virtual networks in the same region, or different regions. For more information, see Requirements and constraints. The following recommendations apply for most scenarios. Follow these recommendations unless you have a specific requirement that overrides them. The hub VNet, and each spoke VNet, can be implemented in different resource groups, and even different subscriptions. When you peer virtual networks in different subscriptions, both subscriptions can be associated to the same or different Azure Active Directory tenant. This allows for a decentralized management of each workload, while sharing services maintained in the hub VNet. Create a subnet named GatewaySubnet, with an address range of /27. This subnet is required by the virtual network gateway. Allocating 32 addresses to this subnet will help to prevent reaching gateway size limitations in the future. For higher availability, you can use ExpressRoute plus a VPN for failover. See Connect an on-premises network to Azure using ExpressRoute with VPN failover. A hub-spoke topology can also be used without a gateway, if you don't need connectivity with your on-premises network. VNet peering is a non-transitive relationship between two VNets. If you require spokes to connect to each other, consider adding a separate peering connection between those spokes. However, if you have several spokes that need to connect with each other, you will run out of possible peering connections very quickly due to the limitation on number of VNets peerings per VNet. In this scenario, consider using user defined routes (UDRs) to force traffic destined to a spoke to be sent to an NVA acting as a router at the hub VNet. This will allow the spokes to connect to each other. Configure the VNet peering connection in the hub to allow gateway transit. Configure the VNet peering connection in each spoke to use remote gateways. Configure all VNet peering connections to allow forwarded traffic. If you require connectivity between spokes, consider implementing an NVA for routing in the hub, and using UDRs in the spoke to forward traffic to the hub. In this scenario, you must configure the peering connections to allow forwarded traffic. A deployment for this architecture is available on GitHub. It uses VMs in each VNet to test connectivity. There are no actual services hosted in the shared-services subnet in the hub VNet. Navigate to the hybrid-networking/hub-spoke folder of the reference architectures repository. Open the onprem.json file. Replace the values for adminUsername and adminPassword. (Optional) For a Linux deployment, set osType to Linux. Wait for the deployment to finish. This deployment creates a virtual network, a virtual machine, and a VPN gateway. It can take about 40 minutes to create the VPN gateway. To deploy the hub VNet, perform the following steps. Open the hub-vnet.json file. Replace the values for adminUsername and adminPassword. Find both instances of sharedKey and enter a shared key for the VPN connection. The values must match. Wait for the deployment to finish. This deployment creates a virtual network, a virtual machine, a VPN gateway, and a connection to the gateway. It can take about 40 minutes to create the VPN gateway. Click Connect and copy the ssh command shown in the portal. From a Linux prompt, run ssh to connect to the simulated on-premises environment. Use the password that you specified in the onprem.json parameter file. To deploy the spoke VNets, perform the following steps. Open the spoke1.json file. Replace the values for adminUsername and adminPassword. Repeat steps 1-2 for the spoke2.json file. Open a PowerShell console in the VM, and use the Test-NetConnection cmdlet to verify that you can connect to the jumpbox VMs in the spoke VNets. Open the hub-nva.json file. Replace the values for adminUsername and adminPassword.